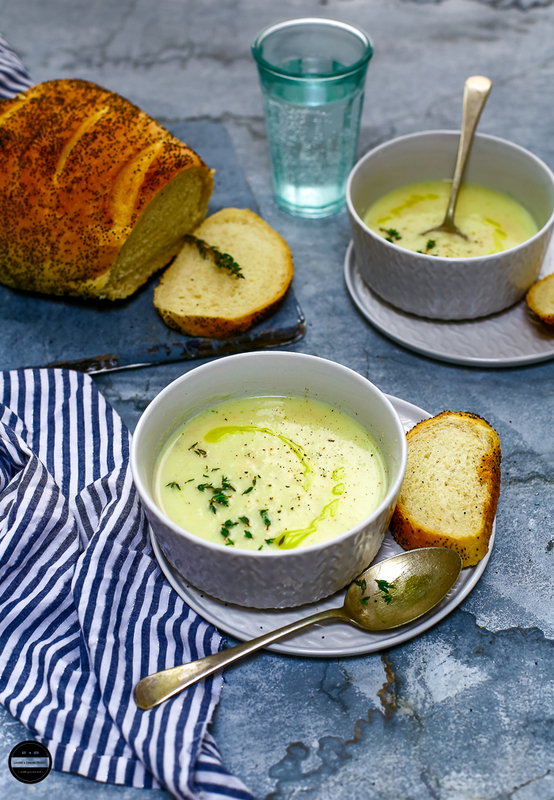 This wonderfully aromatic Roasted Cauliflower, Parsnip, and Walnut Soup is so delicious, creamy and a little sweet. Beware, folks will come for second helpings for this one! And as it's vegan, enjoy Veganuary! I just mentioned above that over the Christmas we had rich, tasty and calorie loaded food, especially we went crazy on potatoes and gobbled so many Roasted Potatoes, Aloo and Onion Paratha, Aloo Tikki, Aloo Matar, and Dry Aloo Bhaji with Methi Thepla just because our local supermarket was selling 2.5kg Potato bag for only for 29p! Crazy right? Not only potatoes but carrots, parsnips, Brussels sprouts and so fresh cauliflower too. I got so greedy and bought almost a half a trolly full all these veggies. Whatever we could use for the recipes I used and all the leftover vegetables I used in making soups and froze them as I knew after coming back from the holiday we will need some food where I don't have to cook much ( oh yes, I do not easily switch off from the holiday mood) also we wanted to start a new year with the healthy note and of course wanted to beat cold and gloomy winter days with these type of piping hot soups. So here I am back to normal and back to blogging with this incredibly creamy, nutty and hearty Roasted Cauliflower and Walnut Soup recipe. 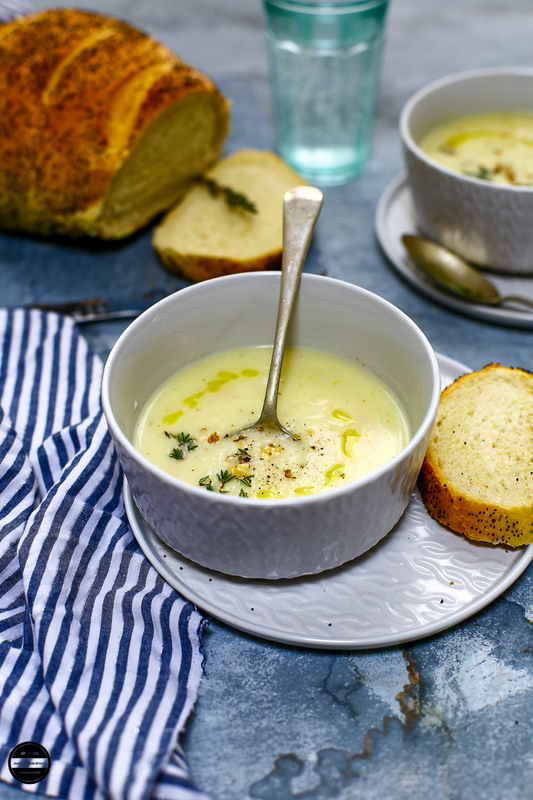 Roasted cauliflower and parsnips lend such sweet flavours to the soup and nutty and crunchy walnuts add more taste and texture, topped with fresh thyme. This recipe is so simple, quick and easy, just throw all the ingredients in the oven for half an hour, while your oven does your work you get on with some stretching.... Perfect and healthy start to the new year. Instead of walnuts, you can use Almonds. 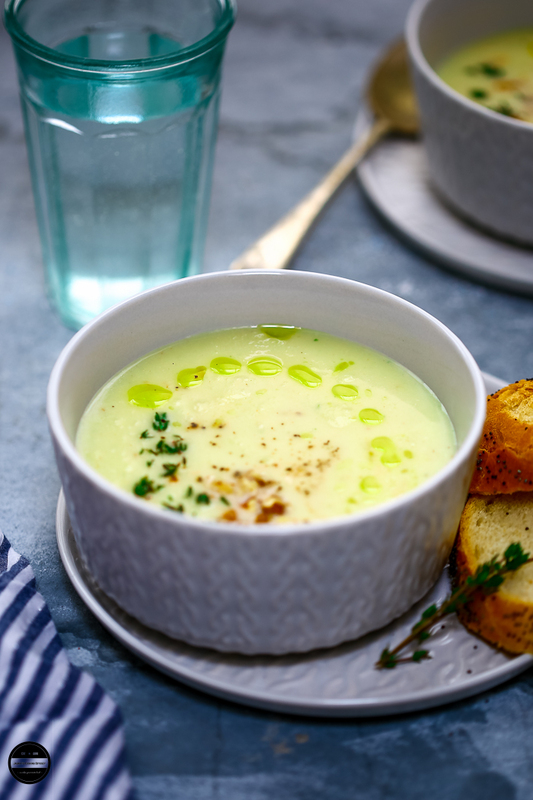 This vegan, quick and easy soup is so delicious and healthy. Preheat the oven to gas mark 4-5.In a baking tray arrange cauliflower florets, parsnips, onion, and garlic.Drizzle a good amount of olive oil and sprinkle little salt and pepper.Let the vegetables bake for 25-30 minutes.Once done remove from the oven, let it cool a bit.Add the soup into a blender with some vegetable stock and make a puree.Returned pureed soup to the saucepan, add the remaining vegetable stock. Heat on a medium heat and check seasoning. Serve in a bowl, sprinkle some toasted walnuts and black pepper. Drizzle some olive oil or walnut oil and garnish it with thyme. 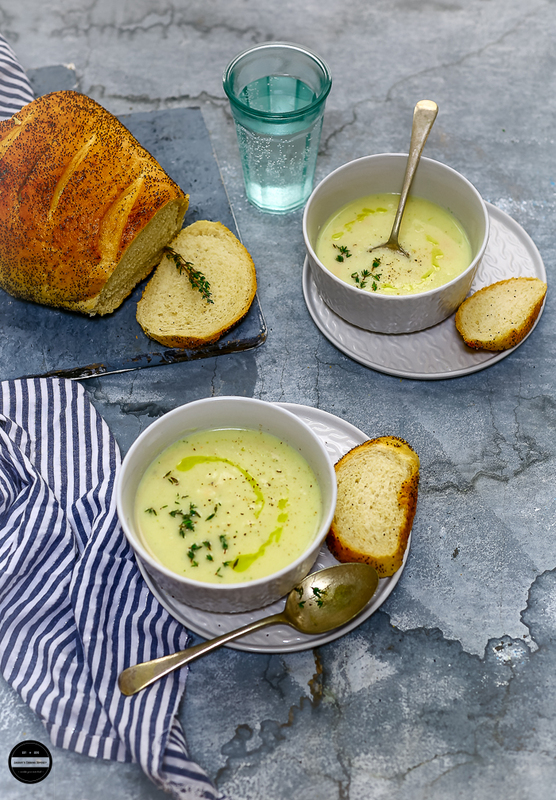 Serve with crusty bread or rolls.Enjoy! Soup looks amazing. Very rich and delicious. I love the choice of ingredients. Healthy, winter vegetables that makes a wholesome dinner option. As always, fabulous clicks my dear. I love the flavors of roasted vegetables, this soup must have been really amazing! Jusy my kind of recipe. Healthy, tasty and so filling. Perfect for the whether. Justice my lord, I need justice. How one can prepare such a delicious soup, where soup is meant to be bland or spicy!? Lol :) Hey Nive thanks for your comment. This soup is not bland but not overly spiced either..it's flavourful though but mildly sweet due to addition of the parsnip. 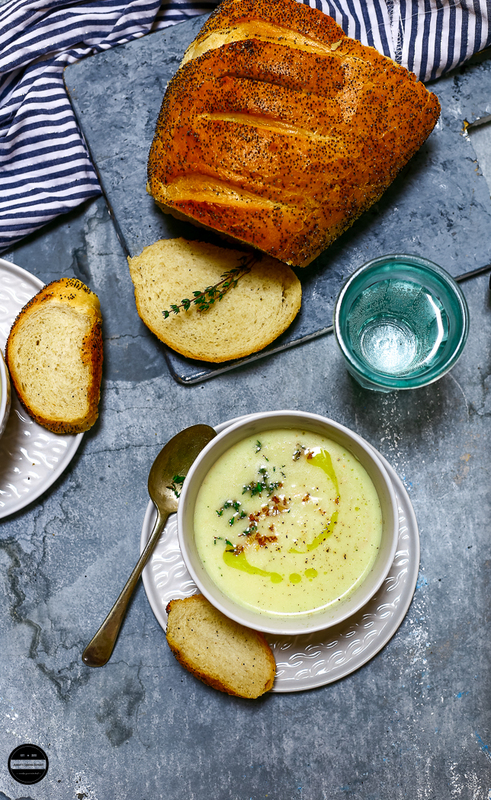 Omg that s an incredibly delicious looking soup and I love that rustic bread too. Did you baked it?? Btw what backdrop you used in the pics, it's gorgeous. Hi Sapana thanks for your comment. Nope, Lol I can not bake a good bread like this :) I thinks it's from the Asda or Tesco, hubby got it. It's wooden board, after painting I left it in the garden and forgot about it, and it rained at night so I am left with this one :) Thinking painting it again. Your food and photographs always amazes me. Pinned this for later. Brilliant share. Let me know hoe it turns out for you. beautiful texture for the soup, what can I substitute for the Parsnip. Thanks! You can use Potatoes or Indian sweet potatoes. That's such a lovely soup, need it now Jagruti. Lovely props.